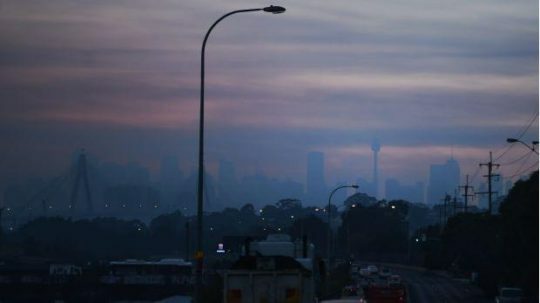 The entire Sydney basin is currently blanketed by thick smoke haze as this photo by Nick Moir in the Sydney Morning Herald today shows. The source of the smoke is trees burning in native bushland south and west of Sydney, this time specifically in at Ripple Creek near Warragamba Dam and the Bargo State Conservation Area south of Picton. But not at this moment, it has been burned out. The government-tasked arsonists call it “hazard reduction”, because they see native forest only as a hazard. So in the off season, that is outside the “bushfire season, government arsonists set fire to forest habitat to justify their existence. They choose a time when the weather is calm and there is a cold air inversion layer so that the smoke is trapped at ground level and lingers around longer. This year, because there hasn’t been much rain over winter, the Rural Fire Starters (RFS) and their Victorian counterparts the Country Fire Arsonists (CFA) plan to commence their Bushfire Season early. “Hazard reduction burns are part of a planned bush fire fuel reduction designed to protect life and property from intense wildfires. These are important controlled burns which will reduce the risk to people and properties from bush fires.” And to back up their rationale, the RFS calls on Professor Ross Bradstock of the University of Wollongong to support them. Not surprisingly, Professor Bradstock believes warm temperatures and low rainfall indicate the state should brace for a “significant” bushfire season. Professor Ross Bradstock’s self-appointed Centre for Environmental Risk Management of Bushfires at the university gets funded out of the RFS annual budget. Why would he not wish to encourage a fully engaged RFS in the off season and on season? Such wanton destruction of remnant wildlife habitat doesn’t stop the annual bushfire destruction during the ‘on season’. It’s just that the naming is different – “hazard reduction” becomes “bushfire”. In fact most wildfires are caused either by escaped hazard reductions or over enthusiastic head burning to counter a wildfire front , but the head burn then becomes the wildfire. Most RFS trucks use petrol to start fires than water to put fire out. The cultural motto is ‘Burn it before it burns, it’s only bush’. It is a culture of bush arson. A full list of planned bush arson was posted on the RFS website covering the state of New South Wales (this list is reproduced at end of this article). 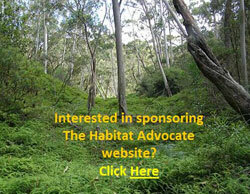 Is it no wonder that Australia leads the world in wildlife extinctions and threatened species? Bushfire is a threatening process, more so when it is widespread which is what hazard reduction sets out to achieve. A threat may be listed as a key threatening process under the NSW Threatened Species Conservation Act 1995 if it adversely affects threatened species, populations or ecological communities, or could cause species, populations or ecological communities to become threatened. Fire kills wildlife. Yet there is no independent ecological assessment of target burns, no thought given to ecologically threatened populations of flora and fauna, or to threatened ecological communities, to critical habitats or to endemic species. In the entire state of New South Wales, the only locations officially declared “critical habitats” are that of Gould’s Petrel out in the distant Tasman Sea, the Little penguin population in in a secluded cove in Sydney’s North Harbour, Mitchell’s Rainforest Snail on tiny Stotts Island Nature Reserve in the Tweed River, and a remote grove of Wollemi Pines in the Blue Mountains, with no current draft recommendations being considered. In the Blue Mountains west of Sydney, with the direction of the custodian, the National Parks and Wildlife Service, over the weekend arson crews set deliberately fire “West of Warragamba Dam” inside the Greater Blue Mountains World Heritage Area. This area is called Kanangra Boyd National Park, an iconic wilderness gem within the World Heritage estate, was deliberately incinerated by the very government authority charged with its care and protection. 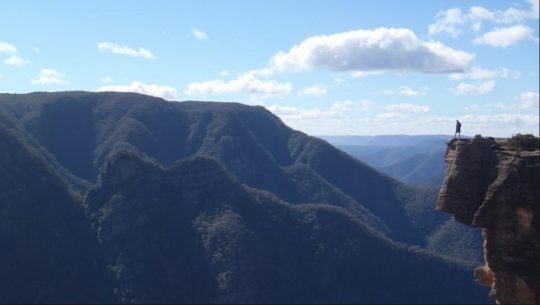 We know the real reason why this vast wilderness region was listed as the Greater Blue Mountains World Heritage Are on 29 November 2000 – a drinking water catchment for an ever growing Sydney. And so yesterday and today the thick smoke from the burnt forests has descended over Sydney. That strong smoky smell has everyone breathing in dead habitat. 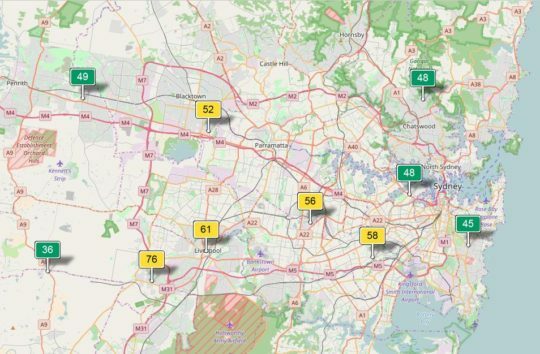 Air quality in parts of Sydney have hit dangerous levels with health alerts for people with lung conditions and asthma. And it’s as if no-one cares about pollution any more. Wood smoke is harmful when breathed in and prolonged exposure can be carcinogenic. The airborne smoke particles vary in size from PM10 to PM25, which is a fine particulate matter each with a diameter between 1.0 and 2.5 micrometers, which is between 1% and 3% the diameter of a human hair. It means that wood smoke can be suspended in air and easily inhaled. Wood Smoke emissions typically comprise the poisons carbon monoxide, nitrogen dioxide, sulphur dioxide, ozone, methane, dioxin, aldehydes (such as formaldehyde), particulate organic carbon, benzene, toluene, styrene, acid gases, napthalene, mould spores, ash particulate, volatile organic compounds and polycyclic aromatic hydrocarbons (PAHs), amongst others. These are all a toxic cocktail to humans and animals alike. Fine particles in the air are able to travel deep into the respiratory tract and cause shortness of breath or worsen pre-existing medical conditions such as asthma. Woodsmoke exposure can depress the immune system and damage the layer of cells in the lungs that protect and cleanse the airways. People who are exercising or doing an activity that causes them to breathe more rapidly and deeply are at a higher risk for health issues – including the volunteer firefighters sent in to do the damage. The long term health consequences can be serious and latent. Children, elderly people, others with pre-existing health conditions such as asthma, chronic bronchitis, and emphysema are also at a higher risk since they are more susceptible to the harmful effects of smoke inhalation. Long term exposure to air with particles has been associated with increases in risks for cancer, lung disease, and cardiovascular disease. Short term exposure typically only causes throat, eyes and nose irritation. Carbon monoxide present in wood smoke can cause throbbing headaches, nausea and confusion. Twenty minutes of active burning may be required to develop sufficient concentrations of CO to reach lethal levels. But once exposed, 40 percent of those with severe poisonings will have long-term neurological impairment, including cognitive (emotional/behavior) dysfunction, short-term memory effects, and sensory motor (vision) problems. 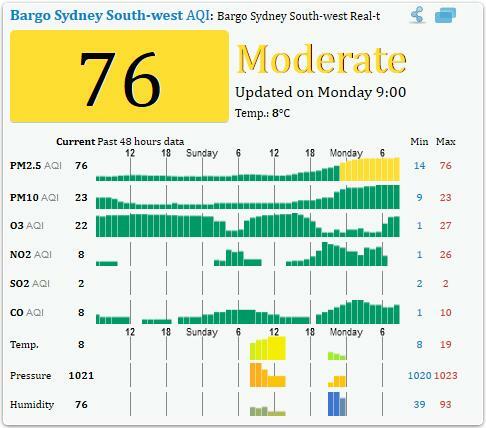 Mix wood smoke in with exhaust fumes from traffic and industry and the dense smog can be lethal with prolonged exposure, such as currently in Sydney. Wood smoke exposure’s long-term effects are less clear, and scientists say more study is needed. Firefighters are susceptible to “camp crud,” colds and viruses that attack immune systems. Wildfire-smoke exposure to mice has been linked to aggressive drops in blood pressure and may cause hardening of the arteries and development of plaque in the arteries. Firefighters can wear devices called dosimeters that detect high levels of carbon monoxide. Compare the safety kit the professionals receive to what the cheap volunteers have to put up with. Wood heaters have been phased out because of the polluting adverse health effects of wood smoke. But hazard reduction is wood smoke on steroids; government sanctioned. Are they trying to kills us? 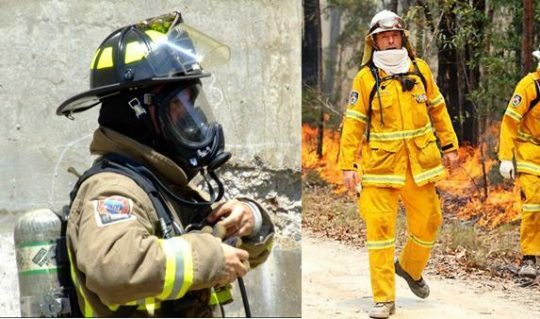 The RFS and CFA pompously dismiss public smoke inhalation concerns saying “consult your asthma action plan”. It’s the same cop out as them saying “trigger your bushfire survival plan.” They seem to presume this relinquishes government’s responsibility another notch. The first notch being government hiding behind volunteers, thinking by doing so somehow provides government with impunity from its emergency performance accountability and public criticism. Image if that attitude was used in the real professional emergency services like police and ambulance. Would we be told “trigger your home defence”, “take the law into your own hands”, and “trigger your first aid kit”? The following Air Quality Index chart for Bargo shows the heightened air pollution on Monday 14th August 2017, caused predominantly by the government’s hazard reduction activities. Note the pollutants shown being O3 (ground level ozone), NO2 (nitrogen dioxide), SO2 (sulfur dioxide), and CO (carbon monoxide). Where are those concerned about greenhouse gas emissions? There seems to be this culturally higher ideal of mitigating bushfire risk which entails burning forest habitat in case it burns. This entry was posted on Monday, August 14th, 2017	and is filed under Threats from Bushfire.